Halloween is the one time of year I’m able to get ridiculously creative with special effects makeup. 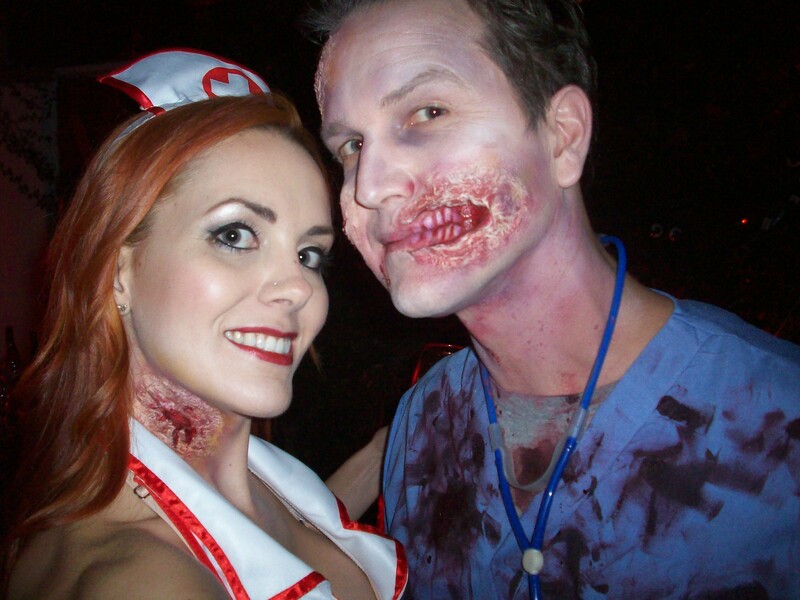 Last year for 2012, we won a costume contest by going as a Zombie Doctor and a Nurse with a zombie bite. Believe it or not, the open zombie wounds were not prosthetics. They were actually created using liquid latex, toilet paper and makeup. I thoroughly enjoyed creating these looks and couldn’t wait to try something new for the next Halloween! For this year, there was no costume contest, but we still had to live up to everyone’s expectations and try to at least match if not beat last year’s costumes. The theme for the 2013 party was “Dressed to Kill.” Ooooh…I do LOVE a good theme! 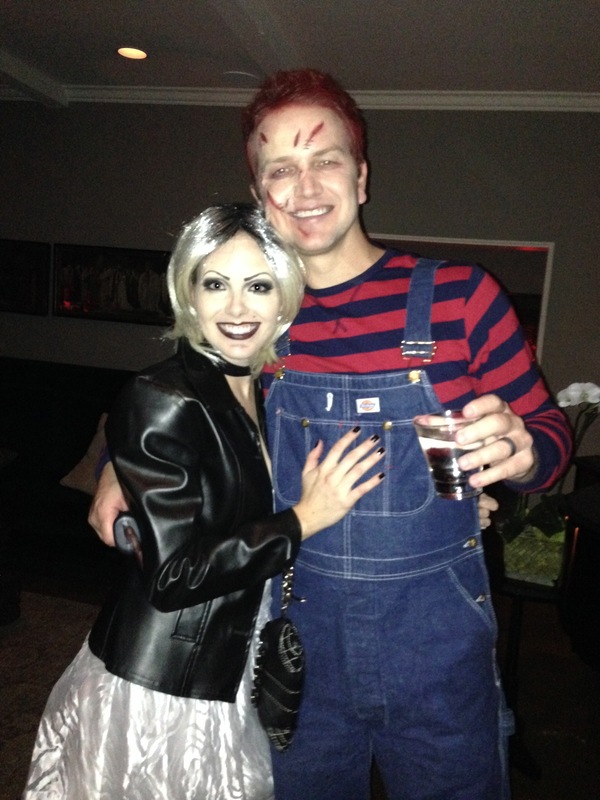 It took quite a bit of brainstorming, but we finally decided to dress up as Chucky and the Bride of Chucky. How do you think we did? Last year, I spent more of an effort on my hubby’s makeup than my own, so this year I spent more time on my own makeup. 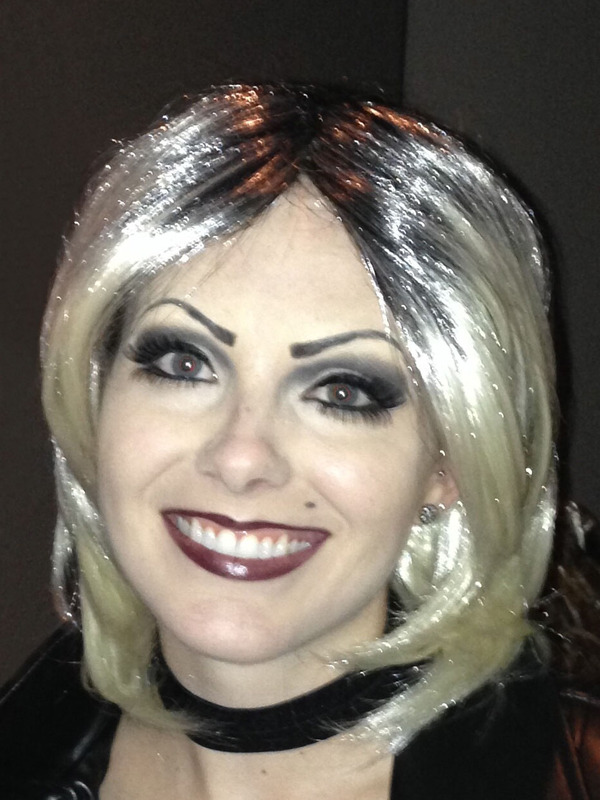 The detail of my makeup that took the most effort was changing the shapes of my eyebrows to make them look drawn-on like the doll’s eyebrows for the Bride of Chucky. I had to cover my eyebrows using a glue stick to help smooth them down. Unfortunately, my eyebrows are rather coarse and thick, which made it quite a process to fully smooth them down. But all-in-all, I think they turned out fairly well considering that it was my first time ever covering my eyebrows to apply makeup over them. Once my eyebrows were smoothed over with the glue stick, I then applied foundation and lots of concealer to fully cover my eyebrows and blend them in with my skintone and the rest of my complexion makeup. Next, I set everything with several layers of a loose translucent powder and applied bronzer to contour. Then I drew on my eyebrows and applied my eye makeup along with two sets of lashes – one for my upper lashline and another for my lower lashline. I completed the look with a beauty mark before applying my lipliner, lipstick and wig. You can see the process below. The first photo is with just my wig cap and no makeup (my eyebrows have been smoothed over with a glue stick). The second photo is with my eyebrows covered and my complexion makeup applied (i.e. foundation, concealer and setting powder). Lastly is a photo of my eyebrows applied with eye makeup, top and bottom lashes and a beauty mark.